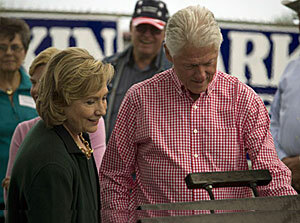 Hillary and Bill Clinton at the 2014 Tom Harkin Steak Fry. A new poll of likely Iowa Democratic Caucus participants finds Hillary Clinton with a huge lead among the party’s potential 2016 presidential candidates. Peter Brown is assistant director of the Quinnipiac University Poll. He says it appears if Clinton runs for the nomination, in Iowa at least, the race is hers to lose. “She’s got 61-percent when Democratic Caucus goers are asked for their first choice,” Brown says. “Senator Elizabeth Warren of Massachusetts is next with 19-percent and no other candidate breaks into double digits.” Today’s Quinnipiac Poll of Democrats in Iowa follows the university’s poll released Wednesday tracking the Republican side. That poll found 25-percent of likely Iowa Republican Caucus-goers would support Wisconsin Governor Scott Walker in a race for the White House. 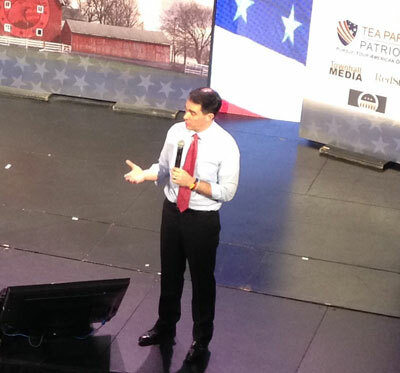 Scott Walker during an Iowa visit in January. “Governor Walker is ahead by roughly 2-to-1 over his nearest competitors,” Brown says. While it appears Walker is poised to become the front-runner in Iowa, Brown is quick to point out that the Iowa Caucuses are still 11 months away and the winner is no shoe-in for the GOP presidential nomination. According to this week’s Quinnipiac Poll, the closest competitors for Walker are Senator Rand Paul of Kentucky (13-percent), physician Ben Carson (11-percent), former Arkansas Governor Mike Huckabee (11-percent), and Florida Governor Jeb Bush (10-percent).